Hastings United Football Club missed the chance to close the gap on the league leaders as it was beaten last night (Tuesday). Second-placed Hastings lost 2-0 away to Whyteleafe in the Bostik League South East Division and remain 10 points adrift of table-topping Cray Wanderers with a game in hand. Hastings were without key midfielders Sam Adams and Jack Dixon through suspension, so 16-year-old James Pool - who has been on loan at Little Common lately - came into the starting XI. Kelvin Ogboe featured for the first time in several weeks as a second half substitute. 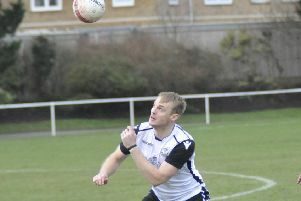 On a wet and windy night, Hastings suffered a double blow when central defender Tom Climpson was sent-off in the 27th minute for bringing down Bradley Wilson on the edge of the area and Wilson scored from the resulting free kick. Whyteleafe, who won at The Pilot Field in the Buildbase FA Trophy last month, sealed their victory with a second goal in the 77th minute, Bryan Akongo heading home a corner to the far post. It was the first time Hastings had failed to score in a league game this season and the first time they’ve gone back-to-back league matches without a victory. Hastings: Horlock, Mensah, Beale, Climpson, Howlett-Mundle, Cruttwell (Ogboe 74), Lovatt, Ajakaiye, Pool (Curran 80), Walker, Bamba. Subs not used: Fielding, Azeez, Makwiramiti. Attendance: 147. Bostik League South East Division top half (played-points): 1 Cray Wanderers 14-38 (+22 goal difference), 2 HASTINGS UNITED 13-28 (+15), 3 Hythe Town 13-24 (+7), 4 Phoenix Sports 14-23 (+5), 5 Whyteleafe 13-22 (+8), 6 Horsham 12-22 (+6), 7 Haywards Heath Town 14-22 (+4), 8 VCD Athletic 13-22 (+3), 9 Ashford United 13-20 (+7), 10 Sevenoaks Town 14-18 (-2).